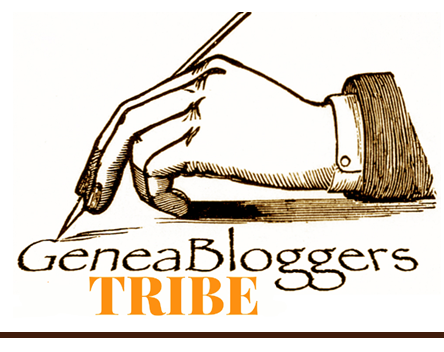 Sepia Saturday provides an opportunity for genealogy bloggers to share their family history through photographs. This week’s Sepia Saturday photo prompt shows a group of boys with sports gear in tow. Something’s missing though…yep, you guessed it. It’s their feet. According to Alan, feet, or the absence of feet, is the theme this week. The photo below fits perfectly with this week’s theme. This is my Grandma Willis Webster. Well, technically, she was my step-grandma. But in every way, she was my grandma because she’s the only grandma I ever knew on my mom’s side. My regular readers may remember that my mom’s mother, Sarah Vasques Madeira, passed away when my mom was very young. Later, my Grandpa Debs Webster met and married Willis Quillin. So, what trip is Grandma Willis getting ready for and who is Lucy? Again, my regular readers my already be familiar with the trip my Grandma Willis was getting ready for. In July of 1952 my Grandpa Debs Webster and his family, including my mom, immigrated to the U.S.A. from Brazil. I started a series of posts recounting their actual journey HERE. I also wrote a series of posts about how this branch of the Webster family (my Grandpa Debs and his family), who were living in Brazil at the time, made contact again with a relative in the U.S.A. You can read about that HERE. So, just who is Lucy? She was one of my Grandma Willis’ sisters. The photo above shows Grandma Willis at Lucy’s home in July 1952, the same month the Webster family immigrated to the U.S.A. They stopped there for a visit. I’m sure it was wonderful for my Grandma Willis and the rest of the Webster family to visit Willis’ sister Lucy before they immigrated to the U.S.A. It must have been a very difficult thing for the two sisters to say goodbye. Willis did make a visit to Brazil later and my mom thinks that Lucy made a trip to the U.S.A. for a visit as well. Lucy’s mom, Helena, was also immigrating with Grandma Willis and her family. So that must have been even more difficult for Lucy. Moving far away from family is difficult even in today’s world of email, Facebook, Skype, etc. I can’t imagine how unbearable it must have been back then without all of our modern technological conveniences. To see what other Sepia Saturday participants have written this week, click HERE. 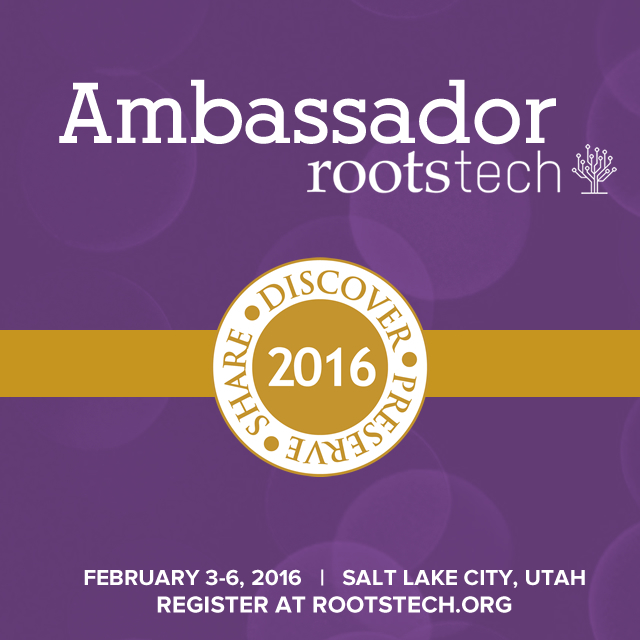 Your Roots are Showing, Dearie! Thanks to Caroline Pointer’s posts "Using OneNote to keep up with those ancestors" and "More OneNote Features to Rock Your Researching World", I have become a OneNote fan! I'm not saying I'm an expert by any means. 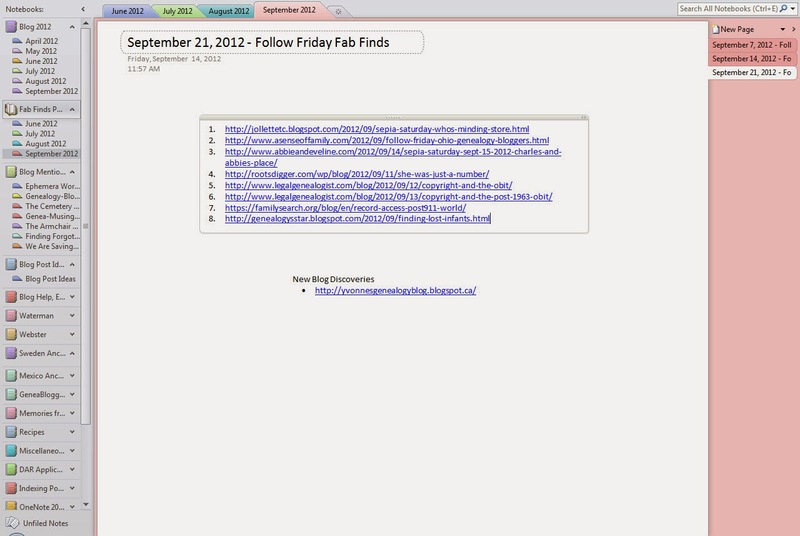 But I have found OneNote to be very useful for my genealogy blog. And I’m not going to try to reinvent the wheel and show you how to use OneNote. Caroline Pointer, as well as others on YouTube, have already done that. What I do want to share with you today is how I put together my weekly Fab Finds posts. Yes, you guessed it. I use OneNote to help me with these posts. It’s a great organizational tool! I've created several Notebooks for my blog and one of them is called Fab Finds Posts 2012. The Fab Finds Post Notebook is then organized by month. And within each month I've created a page for each weekly post. 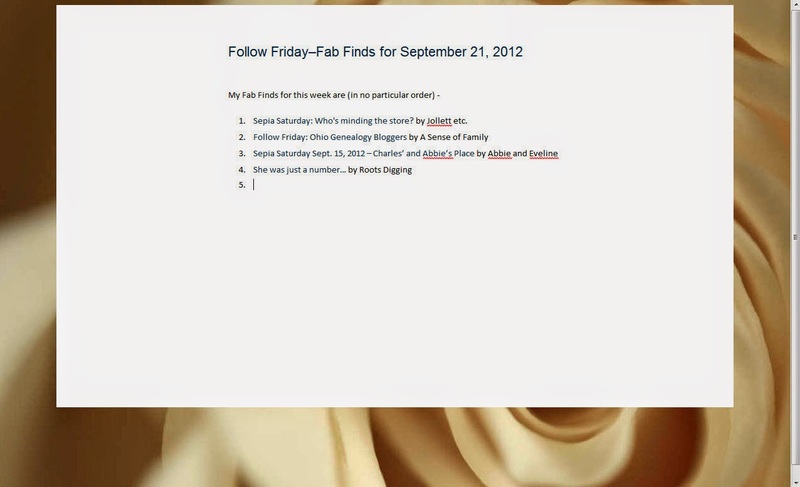 As I read posts during the week, I copy and paste the link of the posts I especially like to the current week's Fab Finds Post page in OneNote. Then when I’m ready to publish my Fab Finds post, I go through the list of potential Fab Finds candidates. 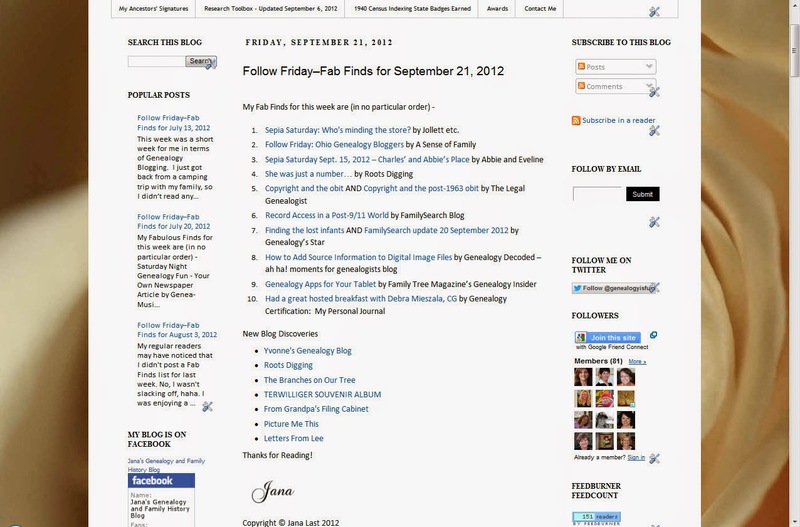 I click on each link, which then takes me to the author's blog. I could just copy the link from OneNote, but I like to actually revisit the blog first. I then copy the link to Windows Live Writer. As I go down the list of blog posts in OneNote, I insert a check mark next to the blog posts I’ve transferred to my draft in Windows Live Writer. Once I’m done, I post the draft to my blog, preview it and then publish the post. Voila! Finished product! ﻿Another perk to my method? In the process, I am building a list that I can refer to at any time. "Oh, where was that post about such-and-such? 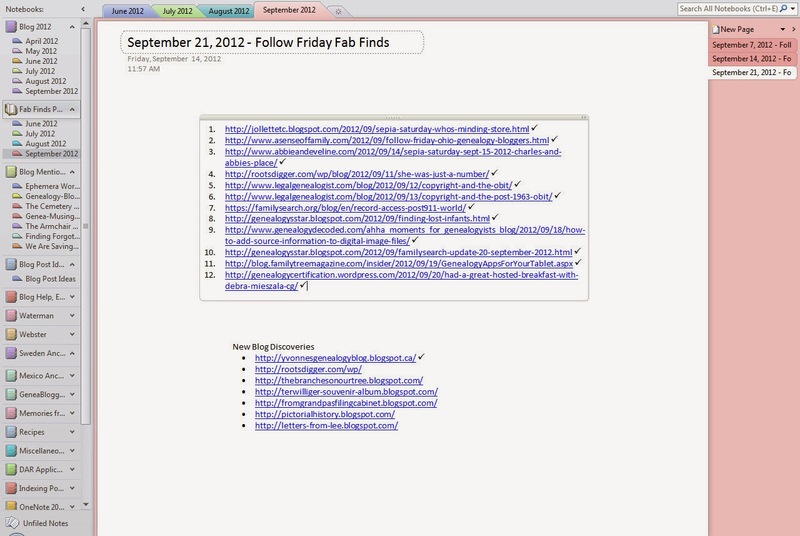 Oh ya, I have it listed in my Fab Finds Notebook in OneNote." 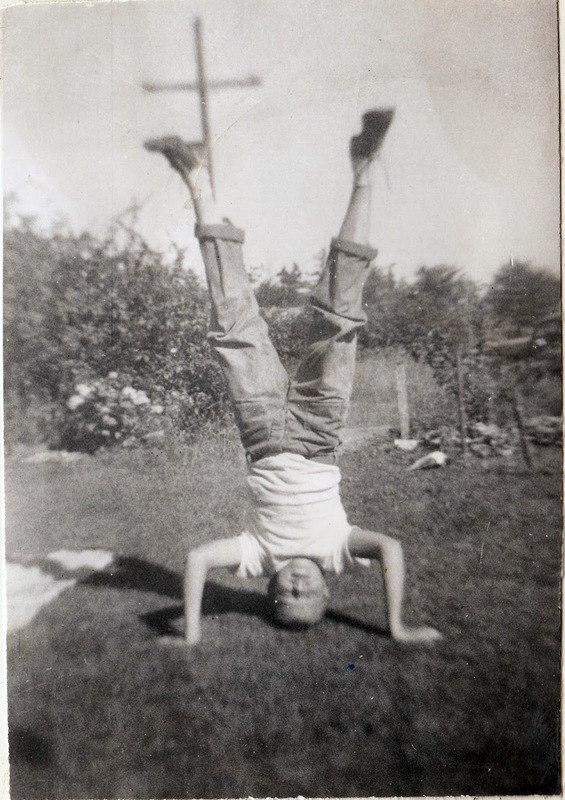 Sepia Saturday 144–Why Not Stand On Your Head? Kind of like our Sepia Saturday photo above. Notice anything unusual? Yep, the gentleman is missing his head. Uh Oh! And that was another option we could have gone with. The inevitable “missing limb photo” from our own photo collections. Instead of showing you a photo of someone missing their head, I’ve decided to share a photo of someone standing ON their head. Who is this you ask? This is Jan Albert Iverson, my Dad. I really don’t know just how old he is in this photo, but I would guess he is a rather youngish boy. And I don't know if he was just being silly or was showing his athleticism (hey mom! look what I can do!). What I do know is that I love this photo of my Dad in his youth. When my two brothers and I were little kids, he would take us to the park on Saturday mornings. He had made a parachute out of silky fabric and attached a heavy metal washer to the ends of the strings. He would throw it high into the air and we kids delightedly watched as it would gently float toward the ground. When we were little kids, our family owned a green 1964 Volkswagen Bug. Remember those? On occasion, my Dad and Mom would gather us kids together and we would all pile into our green VW Bug and drive over to A&W to get Papa, Mama and Baby Burgers and frosty mugs of root beer. Then we would head over to the drive-in to watch a movie. Fun times! My Dad loved football and I remember sitting on the couch in front of the TV watching football games with him. Ya, I still love football! My Dad was a loving husband and father, a computer programmer by profession, and a genealogist/family historian as well. Thanks for traveling with me down memory lane. And to think all these memories started with a photo of my dad standing on his head! To see what other Sepia Saturday participants have written this week, there’s no need to STAND ON ceremony, just HEAD on over to Sepia Saturday. Sepia Saturday: Who's minding the store? by Jollett etc. Debs and his family are on their way to another fun adventure. They’ve left Mount Rushmore and are heading to Yellowstone National Park in Wyoming. I don’t know the exact route they took, but here’s what Googlemaps.com shows as a route today. My regular readers may remember that the Webster family bought sleeping bags and camping equipment to use on their journey across the U.S.A. They would often stop along the way and use their camping equipment to prepare their meals. Previous photos of the Webster family eating at picnic tables along their way haven’t included my Grandpa Debs. So this is a really fun photo of the whole family. Hmm, I wonder who took the photo. My uncle (the little boy seated on the front bench) shared his memories of their trip across the U.S.A. I love what he said about their mealtimes. During an eruption the water temperature at the vent has been known to reach a whopping 204 degrees. The steam temperature of the geyser has reached above 350 degrees. The height of an eruption averages near 130 feet and lasts between 1.5 and 5 minutes. The Webster family also saw some Bison during their visit to Yellowstone National Park. More visitors are injured by bison than by bears each year at Yellowstone. Park rules state that visitors need to stay at least 25 yards away from bison or elk and 100 yards away from bears. I hope you’ve enjoyed your visit to Yellowstone National Park. The next stop on the Webster family’s road trip is Idaho. This week’s Sepia Saturday photo prompt shows the grocery section of the Bell and Macaulay's Store in Drouin, Victoria, Australia. This opens up a myriad of possibilities from which to choose for today’s theme. I’ve decided to stick with the obvious “food” theme and my Grandpa Debs Webster’s scrapbook has helped me out again. From it’s pages, I found this cute circa 1952 vintage postcard to share with you. I’m not sure where my Grandpa Debs bought this postcard, but I find it interesting that it is from 1952. My regular readers may remember that 1952 is the year Debs and his family immigrated to the USA and travelled across the country from New York to their final destination of Southern California. So, I’m wondering if he purchased this postcard somewhere along the way. 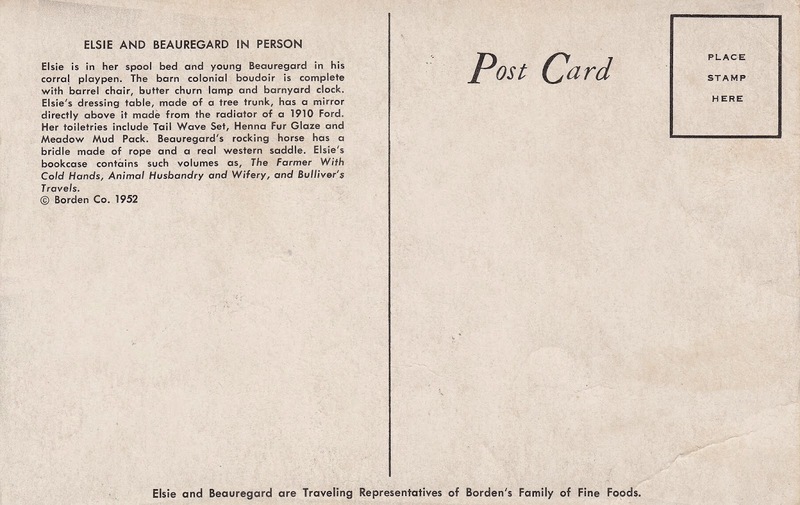 This postcard features Elsie and Beauregard. Who are they you ask? Elsie has been the symbol for Borden Dairy Products since 1938. Beauregard is one of her offspring. Elsie has been an amazingly popular advertising icon for years. She even has her own Facebook page! 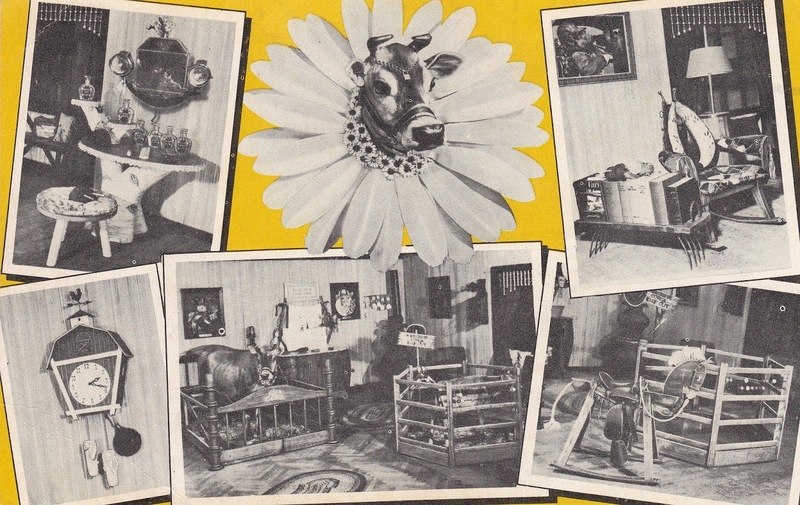 And did you know that Elsie’s husband, Elmer the Bull, is the mascot for Elmer's Glue? And now for your viewing pleasure, I present to you two Borden TV commercials. The first is from 1972 and stars both Elsie and Beauregard. The second is from the 1950’s/60’s and stars Elsie. Borden Chocolate Milk TV Commercial from 1972 uploaded to Youtube.com by RetroGoop. Borden TV Commercial–uploaded to Youtube.com by TVDAYS.COM as compiled & restored by Ira H. Gallen. For more information on the history of Elsie the Cow, click HERE. To see what other Sepia Saturday participants have written today, just “mooove” on over to the Sepia Saturday Blog. Debs Webster and his family are still in South Dakota. They’ve made it through The Badlands. If you’d like to read about their experiences in The Badlands, you can read about it HERE. Now it’s on to visit the amazing Mount Rushmore. As we look at this map showing the distance from The Badlands to Mount Rushmore National Memorial, we need to keep in mind that Interstate 90 was not there in 1952. I really don’t know the route my Grandpa Debs and his family travelled. Did they travel to Rapid City on their way? That would make sense to me as that would be a great place to stop for supplies, etc. Unfortunately, I don't have any personal information about or photos from their visit to this iconic national treasure. We'll just have to imagine what these recent immigrants thought as they gazed up in awe at this magnificent sculpture formed on the side of a mountain. Here are some interesting facts about Mount Rushmore (taken from the Mount Rushmore National Park Service website). 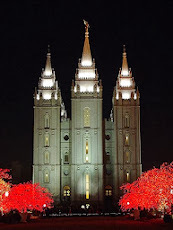 And now for some fun photos of this remarkable monument! I hope you’ve enjoyed our visit to the Mount Rushmore National Memorial. The next stop for Debs Webster and his family is Yellowstone National Park. And yes, this stop on their cross-country trip will include old family photos from Grandpa Debs' photo album. Welcome to Part 3 of Arthur’s On the Job! This will be our last installment in this series. But, don’t worry, I have more photos and stories about Arthur Harry Iverson to share with you in the future. If you've missed the first two installments you can read them HERE and HERE. This photo shows Arthur hard at work on a vintage car. I’m not sure what kind of equipment he is using. Could it be some type of diagnostic tool? In the following photo I’ve zoomed in on the equipment Arthur was using. Unfortunately, the photo quality isn’t high enough to see what the words are on top of the equipment. Thank you for joining me on this three-part tour of Arthur Harry Iverson at work as a mechanic. Until next time…. “The unthinkable has happened!” Those are the words I wrote as I began writing about 9/11 in my journal. I can’t believe it’s really been eleven years now since it happened. Thomas MacEntee of GeneaBloggers suggested we write a post recalling our memories of that horrific day. I live on the West Coast. I was awake when 9/11 happened, getting ready for the day. FoxNews was on our TV. An alert came on saying a plane had crashed into the World Trade Center. We thought it was just a terrible accident. But then the next plane crashed into the other tower. My husband saw it happen live on TV. Then we knew it was no accident. We were being attacked. We watched this all unfold as if mesmerized. I wrote in my journal that I felt like I was in a nightmare. I was in shock. I went through the motions of getting the kids to school but was gripped with fear of what had just happened. Our five kids ranged in age back then from high school age down to elementary school. I remember taking my youngest kids to elementary school and as we were waiting out on the playground for the bell to ring, a strange and foreign thought ran through my mind. The vague thought of concern about planes that were in our skies that morning. We live not too far from an Air National Guard station. Also our city airport isn't too far away. I really wasn't too concerned about our little corner of the world, but still. After coming home from taking the kids to school, I was of course glued to the television, watching the horrific and unbelievable events of the day taking place. Then there was the void of airplanes in the sky in the coming days. That was very eerie. Our world has changed since 9/11. Our sense of security has changed as well. We had the attack at Pearl Harbor, but that was a generation or two ago. Now our generation has it’s own attack on U.S. soil to remember. I hope that we will always remember 9/11 and those who perished that day, as well as those who risked their lives trying to save others. And I hope we remember those in the military, some who have made the ultimate sacrifice, who willingly serve so that we can enjoy freedom and safety. Today’s Sepia Saturday photo shows three elegantly dressed people wearing and/or holding three hats. To be more exact, the two ladies are wearing their hats and the gentleman is holding his hat. So, here’s my amazingly similar photo I have to share with you today. 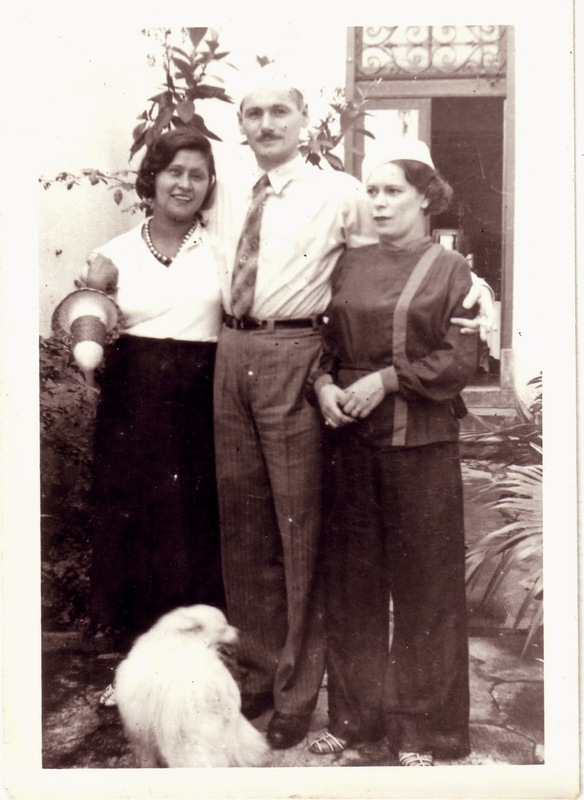 It’s a photo of my Grandmother Sarah Vasques Madeira Webster (right) standing with my Great-Grandaunt Crecenciana Aurora Matus Villatoro Reinacher and her husband Theodor Reinacher. Actually, having this photo in our family's possession is a prize in itself. My regular readers may remember who my Grandmother Sarah is standing on the right in this photo. I’ve written several posts about her including a previous Sepia Saturday post. She was married to my Grandpa Debs Webster. And they were my mom's parents. Now I’d like to introduce you to Crecenciana Aurora Matus Villatoro. Crecenciana was one of the sisters of Esther Matus Villatoro who was married to my Great-Grandpa Watson (Frederick) Webster (a.k.a. The Traveling Dentist). Crecenciana was born in Arriaga, Chiapas, Mexico on September 14, 1906 and later moved to Brazil. I wonder if she moved to Brazil to be closer to her sister Esther. On April 4, 1932 Crecenciana Matus Villatoro and Theodor Reinacher were married in Sao Paulo, Sao Paulo, Brazil. Crecenciana also went by the name Chana. 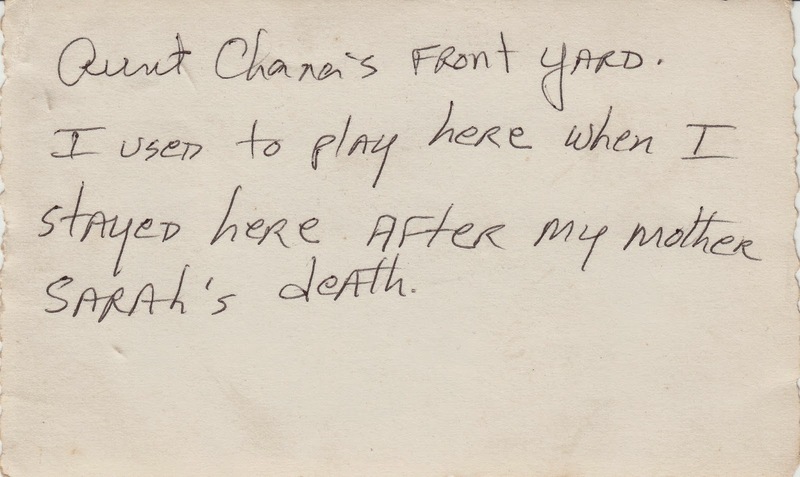 My mom has fond memories of her Great-Aunt Chana. Following the death of my Grandma Sarah Webster (my mom's mother), Aunt Chana took care of my mom for a while. My mom was only six years old at the time of her mother's death. 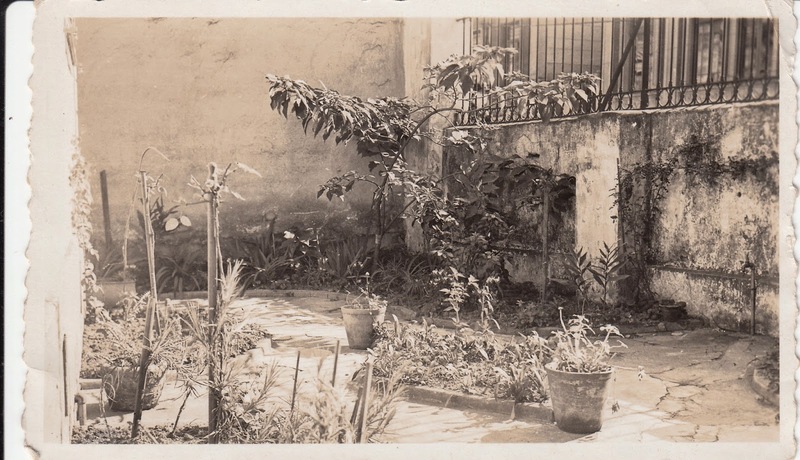 Below is a photo showing Aunt Chana’s front yard in Brazil. ﻿Crecenciana passed away on July 29, 1973 in Sao Paulo, Sao Paulo, Brazil. Thank you Aunt Chana for your kindness to my mom during a very difficult time. To see what other Sepia Saturday participants have written about this week, just click HERE.